It may be time to stop taking your morning cup of joe for granted. (At the very least, your assistant would surely appreciate it.) 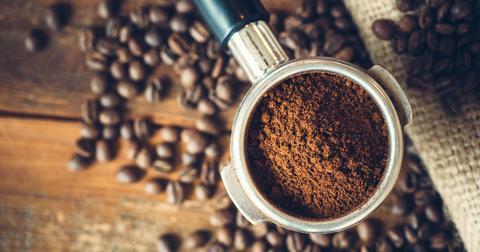 According to a new study, the two varieties of coffee that make up most of our consumption — along with a variety of others — are at risk of extinction. And if we don't take action in the near future, certain coffee crops could be extinct in 10 to 20 years. The study, which was published by Science Advances and conducted by the Royal Botanic Gardens, the University of Nottingham, and Queen Mary University of London, found that 60 percent of coffee species are threatened with extinction. To be specific, of the 124 known coffee species in existence, 13 species are critically endangered, 40 are endangered, and 22 are vulnerable. 35 coffee species are not threatened, and the remaining 14 did not have enough data to draw any conclusions. Arabica and robusta the are world's most widely-consumed coffee varieties (you've probably seen blurry versions of those words written on coffee bean packages while waiting for your barista to finish brewing your first cup of the day). According to a study published on Nature, arabica makes up 60 percent of global coffee production, and robusta makes up the other 40 percent. So yes, they are both on the list of endangered coffee species. CNN spoke with Aaron P. Davis, one of the researchers who conducted the study, who emphasized the need to preserve coffee's habitat: the rainforest. "The important thing to remember is that coffee requires a forest habitat for its survival," David told the outlet. "With so much deforestation going on around the world, wild coffee species are being impacted at an alarming rate." Davis added that human activity, deforestation, and climate change are all contributing to these coffee species becoming endangered. If humans continue this activity, Davis thinks arabica coffee could become extinct in just 60 years, CNN noted. So, what would happen if arabica or robusta crops continue moving towards extinction? Helen Chadburn, who worked on the study and is a Species Conservation Assessor at the Kew Royal Botanic Gardens, spoke with Popular Mechanics about that risk. "Some other coffee species are naturally low in caffeine, or have an excellent (and unusual) flavor," she told the magazine. Basically, different species of coffee — that might have different tastes or caffeine content — would have to become the new norm. Additionally, since climate change is a contributing factor to the deforestation of coffee habitats, you can continue working to lessen your environmental impact. Reducing your consumption of single-use plastics, animal products, paper, and so much more all have an affect on the earth. So if you don't want your coffee order to change, now would be a good time to make a few easy changes to make your daily routine more eco-friendly.